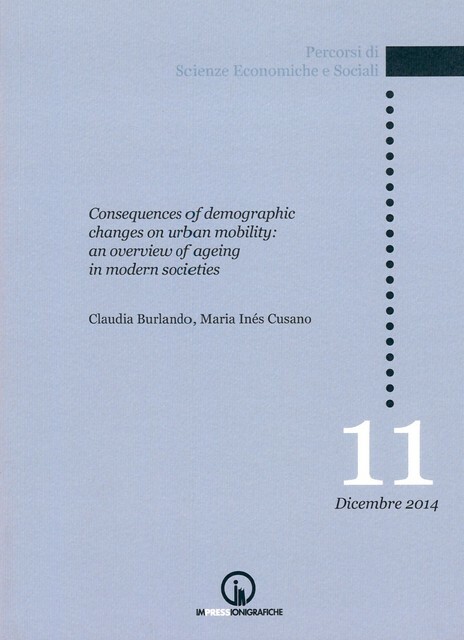 The work is organized as follows: After this brief introduction to the topic, section 2 is devoted to assess the main characteristics and effects of the current demographic transition with a short overview on the Italian scenario that is an interesting case due to its being one of the European countries with the highest share of senior citizens. Section 3 provides a literature review of the main topics in the scientific field connected to the effects of ageing on urban transport. Section 4 focuses on the analysis of three main transport modes (private mobility, public transport and flexible transport services) in a scenario of demographic changes by addressing the state of the art, providing some insights on different policies that are currently in place and highlighting some possible strategies to face the future. Section 5 is devoted to some insights of the Italian scenario and to the identification of the main challenges connected to the urban transport planning in an ageing society. Lastly, section 6 focuses on a series of final remarks and considerations. One goal of this work is that of assessing what is the state of the art regarding the existing solutions and plans for the urban mobility in an ageing scenario, a kind of study that currently lacks and that could be a valuable tool for policy maker and local authorities. Furthermore, this volume also attempts to give some “food for thought” to urban transport planners and decision makers and that would open a debate regarding the importance of taking the matter seriously in the political agendas as we believe that ignoring the challenge this demographic change poses should not be an option.